You will probably be aware that, two weeks on from the shocking terrorist attacks against three tube trains and one bus in London, a second wave of attacks took place. There are two main messages in these attacks - the intended message and the unintended message. The intended message was that the terrorists can deliver terror payloads one after another, at will. The selection of three trains and a bus - the same target pattern as the first wave - seems designed to communicate the message: "We will attack at the time and place of our choosing, even when you are at your highest level of alert." However, the failure of this second wave communicates an important unintended message. While the use of home-grown, 'cleanskin', minimally trained operatives in suicide attacks is terrifying and poses major problems for counter-terrorism efforts, it seems such people still need intensive training and the help of highly skilled explosives experts in order to carry off a smooth attack. After the first attacks, it was discovered that the suicide bombers had travelled to Pakistan, where they were exposed to radical Islamic teachings, and presumably given rudimentary training. It was also found that a foreign terrorist minder had flown out of Heathrow just before the first attacks took place. Al-Qaeda's operational model requires that operatives 'emigrate' (hijrah) to areas of training and preparation before returning to the target country to carry out 'raids' (ghazwah). The importance of thorough training and indoctrination is emphasised. As Usama bin Laden has said, "He who migrates repeatedly is doubly rewarded." All four bombs in this attack failed to explode, presumably because they were constructed by less well trained operatives. It has also been reported that the amateurish would-be bombers left a treasure trove of forensic evidence. The details of the London attacks therefore show that the proverbial "guy next door" can't suddenly 'become' a terrorist after all. By keeping an eye on the behaviour of those who travel to countries where terrorists operate, the authorities can thwart future attacks. Since September 11, many people have tried to get a handle on the sources of Islamic terrorism. Several assertions have become common around dinner tables, water coolers and weblogs around the world. And although these opinions are often informed by a level of research and thought, the Muslim world is extremely complex, leading to assumptions that are sometimes half true, and sometimes outright wrong. Saudi Arabia is dominated by Wahhabism; Saudi Arabia's problems stem from this ideology. Usama bin Laden is from Saudi Arabia, so al-Qaeda is a Wahhabi organisation. Muslims fall into two broad categories: those who want change and support peaceful means such as education and social welfare, and the violent extremist conservatives who refuse to recognise the need for change or education in the Middle East. The Middle East's problems stem from backwardness. What the Middle East needs is more education. The Saudi royal family has supported Islamic radicals - there is no rational reason for this. We invaded the wrong country and toppled the wrong regime - we should be overthrowing the Saudi terrorists! It was with these myths about Saudi Arabia, Wahhabism and Terrorism in mind that I wrote the article, Understanding the Origins of Wahhabism and Salafism, which has recently been published in the Jamestown Foundation's Terrorism Monitor. In this article, I show (contrary to common perceptions even amongst some Muslims) that Salafism and Wahhabism started independently as quite different movements in different places. Salafism was an Egyptian-centred movement that attempted to reconcile Islam with Modernism, whereas Wahhabism was a Najdi (now part of Saudi Arabia) movement that rejected modernity outright. The most important Salafis, from Muhammad 'Abduh through Muslim Brotherhood founder Hassan al-Banna and MB ideologues such as Sayyid Qutb and his brother Muhammad Qutb, and later terrorist leaders such as Salih Serriya, Umar Abd al-Rahman and Abdullah Azzam, have been educationalists. It is a little recognised fact that education and public services have remained a major plank of Salafi ideology - not just for moderate Salafis, but for the radical takfiris as well. While more moderate Salafis saw education as a way of gradually awakening the whole society to Salafi Islam, takfiris inspired by Sayyid Qutb saw education as a way of awakening a revolutionary vanguard. In Egypt under the monarchy, pan-Islamist Salafism and secular pan-Arabism had been close to each other. The Salafis saw pan-Arabism as a step towards the goal of pan-Islamic unity. However, the Muslim Brotherhood fell out of favour with the pan-Arabists in the early 1950s, soon after the Free Officers' Coup. King Faisal of Saudi Arabia gave santuary to the Muslim Brotherhood dissidents in Saudi Arabia, and allowed them to teach in the new Universities. This policy was based on quite rational considerations, as it resolved both a foreign and a domestic policy crisis in one move. However, it also fundamentally changed the Saudi religious doctrine, and submerged it as a hybrid theology, a sub-category of Salafism. A generation of Saudi graduates was taught this 'official' ideology by Salafi teachers. Despite the essential rationality of the policy, Faisal, and later Khalid, had been too indiscriminate in the range of Salafis they had allowed into Saudi Arabia. Some of the most important mentors of today's terrorists were teaching in Jeddah in the late 1970s, among them Muhammad Qutb, Maulana Maududi, Abd al-Rahman and Azzam. They 'awakened a revolutionary vanguard' in Saudi Arabia, the solid foundation (al-Qaedat al-Sulbah) for the predicted future Islamic state. Saudi Arabia has since moved against the takfiris such as al-Qaeda, and confines its funding of Salafism to a those Salafis who condemn the radical tendency in Salafism. The result is a profusion of Salafi groups (often going by the name Ahl as-Sunnah wal-Jamaah, People of the Prophetic Tradition and the Muslim Community) which accuse each other of not being real Salafis. Neither regime change in Saudi Arabia nor simply increasing the quantity of education are panaceas for the Middle East. It was education by the wrong people that got us into this mess, and the Saudi monarchy is on the right side of a battle within Salafism. To find out more, please read the article at Jamestown's web site. Most of us would agree that a person who deliberately attacks civilians in order to terrify the population for political ends is a terrorist. But this has long been a vexed question for many in the media. The reason is that many journalists or editors support the Palestinian side in the Palestinian-Israeli dispute. Operating from a 'post-colonial' viewpoint, these people incorrectly cast the Israelis as imperial colonisers and the Arabs as the oppressed, indigenous inhabitants. Attacks against Israelis, therefore, must be placed under the category of glorious 'resistance'. Consequently, many media outlets avoid calling attacks against civilians 'terrorism' if the attacks are carried out by Palestinians against Israelis. Those who support Israel's right to exist and/or oppose terrorism in all its forms have long criticised the hypocrisy of those media who inconsistently refer to some attacks as 'terrorism' while referring to identical attacks against Israelis as 'militant activity' or 'resistance'. This appears to be the cause of a quiet change made by the British Broadcasting Corporation. Several BBC news stories on the web called the London attacks and their perpetrators by the correct name, 'terrorist', but soon afterwards, the wording was changed. The Google search engine entries still quoted the original words for some time, but when the link was followed, the word terrorist had been changed or removed. For example, the story "Bus man may have seen terrorist" became "Passenger believes he saw bomber", and the words "A bus passenger says he may have seen one of those responsible for the terrorist bomb attacks in London" became "A bus passenger says he may have seen one of those responsible for the bomb attacks in London". In another story, the words, "on the morning after the worst terrorist atrocity Britain..." became "on the morning after the worst peacetime bomb attacks Britain has seen". Apparently, someone at the BBC doesn't consider bomb attacks to be terrorism. Screenshots of these changes can be see at Hurry Up Harry Blogspot. Clearly, when we minimise terrorist attacks against one section of humanity, consistency demands that we minimise terrorism against our own. The BBC's decision to erase the word 'terrorism' from its web page, except in mocking quotation marks when used by a public figure, demonstrates that the disregard for the lives of Israeli civilians has now translated into disregard for the loss of British and other civilians. Wouldn't it have been better if the BBC had simply begun referring to all terrorism by its correct name? Italian police have arrested around 140 people in Milan, many of them migrants, and seized a quantity of explosives, in the wake of Thursday's bombings in London. Italy, as a former colonial power and a country divided over its significant contribution to the Iraq coalition, has been assessed by al-Qaeda as one of the weak links of the Western alliance, alongside Spain. It is normal for any police or intelligence operation tracking organised criminals or subversives to leave suspects 'in the wild' and gather further intelligence by observing their movements and communications. It would appear Italy has determined that this is an appropriate time to 'draw in the nets'. Both shadow attorney general Robert McClelland and Opposition Leader Kim Beazley have recently spoken about Labor's current policy in relation to Australian troop commitments. My discomfort with the policy approach of the previous Opposition Leader, Mark Latham, is on record. Under Latham, Labor policy changed regularly, and seemed to be aimed at appeasing terrorists after Madrid. Consequently, I found it unsurprising that the Australian Embassy in Indonesia was attacked during the Australian election campaign. I had hoped that the Beazley leadership would dispel some of these concerns, and indeed the flamboyant policy swings associated with Latham are a thing of the past. However, the new policy line still gives cause for concern. McClelland has stated that Australian troops should be drawn out of Iraq and moved into Afghanistan. Beazley has made slightly different statements, saying simply that Australian troops should be taken out of Iraq, whether they are redeployed to Afghanistan or not. The rationale for this proposed redeployment is that Afghanistan is more relevant to specific Australian national interests because of its role in the international narcotics trade, which funds terrorism. From the outset, I agree that Afghanistan is an important and possibly neglected theatre in the War on Terror. However, beyond this fact, there are serious problems with Labor's policy. First, the inconsistency between the statements of Beazley and McClelland suggest that there is either division or simply a lack of detail in the ALP's policy. This is dangerous in such an important policy area. Second, there is the timing of the announcements, which makes it seem as if the ALP is responding to the London attacks with a commitment to withdraw Australia from Iraq. Whether the timing was intentionally or unintentionally linked to the London blasts, this looks dangerously like appeasement, and a win for the terrorists. Third, there is the continued emphasis on specific national interests, which ignores the global nature of terrorism. Yes, the narcotics trade is important to funding terrorism, and yes many terrorists were trained in Afghanistan. But most of these terrorists have now moved from Afghanistan to Iraq, Europe and our own region. It is likely that the terrorist attacks in London were carried out by Abu Musab al-Zarqawi's wing of al-Qaeda, which departed Afghanistan in 2001 and now operates primarily out of Iraq. Troops in Afghanistan could not have stopped the terrorists who committed the London attacks, and by extension they would be unlikely to stop attacks on Australia - the primary front in the War on Terror is now clearly Iraq. Withdrawing the international force from Iraq will not change that fact. If the international coalition abandons Iraq in the near future, al-Qaeda will move onto the next phase in their revolutionary model, the wholesale destruction of the fledgeling Iraqi Government. Terrorists will then fill the vacuum in Iraq and begin 'exporting the revolution', with terrorist attacks across both the West and the Middle East. If Labor is incapable of seeing the relevance to Australian interests of Iraq's status as either a terrorist state or a democracy, perhaps the party should consider the relevance to our interests of the most oil-rich parts of the world being a haven for terrorist operatives. Drugs may be a lucrative source of terrorist funding, but their relevance is peripheral when placed alongside the importance of oil to the world economy, or the geostrategic importance of Iraq in world stability. More than ever, we live in a world where events on the other side of the world impact directly on our interests. Finally, the policy of shifting our military focus from Iraq to Afghanistan is actually superficial. While Afghanistan would certainly benefit from the re-commitment of the SAS to counter-insurgency operations, and our defence force's well known strengths in the area of peace keeping and reconstruction, around half of our personnel in the Middle East are actually stationed in the Persian Gulf. Our naval and air resources in the region are already relevant to both Iraq and Afghanistan. What would a shift of focus from Iraq to Afghanistan mean for these forces - that Australian ships would turn a blind eye to terrorists or smugglers plying the waters in the Gulf? Labor's policy seems to be a largely cosmetic attempt to play to a domestic audience and differentiate itself from the Government. Coming straight after the London bombings, the policy announcements are irresponsible. The ALP must change if it is to become fit for Government. While travelling home by train last night, my fiancee and I were surprised by a sudden loud bang and the sound of small objects bouncing around the carriage. A large rock had been thrown through the window directly behind us, showering us with glass beads, although obviously the first thing that went through our minds was the London bombings. The train driver declined to report the incident immediately on the basis that he would have to put us all off the train as a matter of standard policy. Presumably the teenagers will be out tomorrow scaring another train full of passengers. We were on our way back from a trip to the centre of Melbourne. On the train journey into the city centre, a man entered carriage carrying a clear plastic bag. Amongst other items, the bag contained two large knives. Several inches of one blade were poking out the side of the bag. An objective of terrorism is to sow panic. Accordingly, it is important to be conscious of the risks in order to make such attacks less probable, but to avoid unnecessary alarm. The risk of terrorism is real, and should be taken seriously. Carrying knives in full view, throwing rocks at trains, and failing to take rock throwing incidents seriously makes it difficult for the public to distinguish between real threats and false alarms, and also ratchets up the level of unnecessary alarm upon which the terrorists rely. Adding to the list of inconsistencies in early media reports of the London blasts, investigators have found that all three bombs in the London Tube detonated simultaneously, not spread over a 45 minute period as previously reported. The package bombs consisted of 5kg of high grade explosives detonated using timing devices. The explosives were presumably imported into Britain or, as in Madrid, purchased on the black market. They would not have been cooked up in a home lab. In an interview with ABC News Radio today, Aldo Borgu of the Australian Strategic Policy Institute claimed that the simultaneity of the attacks and the use of timers suggested that several different 'teams' carried out the attacks. I disagree. Al-Qaeda and related groups have previously demonstrated that it is possible for a single team, or even a single individual, to place several timed explosives on different vehicles. For example, we know of Ramzi Yousef's "Bojinka Plot", a sophisticated plan to plant bombs on board ten different aeroplanes, all of which was later scheduled to fly over the Atlantic to the US more or less simultaneously. Although this was thwarted when Yousef's home bomb laboratory caught fire, the plans recorded on his laptop demonstrated that the plan was quite viable. The London bombs could have been placed under train seats by a single plotter who simply changed trains repeatedly, perhaps being met at prearranged rendezvous points by an accomplice carrying the bombs in a car or van. More likely, three or four individuals of the same team could have taken different trains that morning, each of them planting their bomb on a particular train. There is no need to jump to the conclusion that this cell has enough members to operate several multi-member teams. One of these plans apparently ran into some sort of hitch, resulting in the bus bombing slightly later. 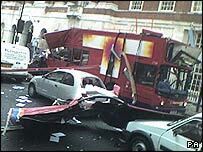 The discovery of a dead suspect on board the Tavistock bus more likely suggests an accident on the terrorists' part, rather than a deliberate suicide bombing. 20,000 people have been evacuated from the centre of Birmingham amid a credible bomb threat. One suspect package aboard a bus has been destroyed by a controlled detonation. Authorities have reportedly said that this incident is unconnected to the London blasts. It is difficult to know what to make of this at such an early stage. Is it perhaps a different cell? Is it a copycat, a prank attack, or just a bag left on a bus? Are the authorities playing down the connection until they know for certain that one exists? No doubt we will find out in coming days. The BBC World webpage has a web page with an interactive map showing the locations of the four blasts and outlining what happened in each case. The time between the first blast (at Liverpool, 8:51) and the last (Tavistock, 9:47) actually suggests that the bombs could have been planted separately by operatives moving from place to place. 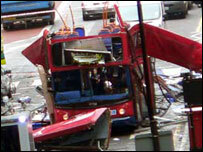 After the train system was halted and passengers transferred to buses, the terrorists attacked the bus at Tavistock. Yesterday morning, terrorists committed a cowardly, repugnant and evil attack against the citizens of London. It seems highly probable that this was timed to coincide with the opening of the G8 Summit - which means that it is also a symbolic attack against the governments of the world's most advanced countries. The media have been quick to say that this organisation was previously unknown, and some have begun to speculate that this means there is a new, completely independent organisation operating in Britain. There is no reason to jump to these conclusions. During the late 1990s, both Abu Musab al-Zarqawi and Usama bin Laden's al-Qaeda independently developed parallel terrorist networks in Europe. Al-Qaeda's statements at that time differentiated between "Al-Qaeda in Europe", "Al-Qaeda in the Arabian Peninsula" (Saudi branch) and so on. When Zarqawi's Jama'at Tawhid wal-Jihad (Group of Monotheism and Holy War) merged with al-Qaeda last year, it followed this system of nomenclature, except that it retained the word "Jihad" in its name. Since then, Zarqawi's messages have called the organisation Tanzim Qaedat al-Jihad fi Balad al-Rafidin (Organisation of the Base of Jihad in Iraq/Land of the (two) rivers). The banner used in an April 2005 statement by Al-Qaeda in Iraq. Close-up: The text reads Tanzim Qaedat al-Jihad fi Balad al-Rafidin. (Organisation of the Base (Qaeda) of Jihad in Iraq). The statement of responsibility for the London bombings is essentially signed "Secret Cell of Zarqawi's European Al-Qaeda network." I am assuming the message is genuine and the attack was carried out by Zarqawi's wing of al-Qaeda. It is highly unlikely that a new group would have the dedicated personnel, logistical expertise, technical expertise (such as knowledge of explosives) and resources to carry out such a sophisticated attack. This question can be approached in several ways. Why London? Why now? Why are al-Qaeda Attacking the West at all? And so on. The purpose of this attack, like most such attacks, can be summed up in a word: Division. Broadly, al-Qaeda seeks to divide the Western world from Muslim countries, to isolate Western countries from each other, and to divide individual countries internally. In this sense, the 11 March 2004 Madrid bombings were a success for the terrorists. Since they are, in form, so similar to yesterday's London Bombings, they serve as an ideal benchmark against which to measure the success of the attacks. In Madrid, serious division over the country's foreign policy already existed; between the two major parties, between the government and the population, and between Spain and some of its neighbours. Coming at the end of an election that had been largely fought over these faultlines, the attacks had a seismic impact on Spain. The populace turned against the Government. Spain changed from one Western camp to the other. Most importantly, Spain withdrew from Iraq. If that is the benchmark of a successful terrorist attack, then this attack has failed. The British people did not panic as the terrorists' statement predicted, and nor did they turn inwards, blaming each other. Britain has a culture of stoic defiance in the face of adversity. Moreover, it has the most efficient and professional terrorist emergency response system in the world, with the possible exception of Israel. Britain was already taking serious legislative steps against the threat of Islamic terrorism before the 'wake up call' of 11 September 2001. Obviously, Britain's experiences with IRA terrorism contribute to this stoic attitude to terror attacks, but it should be remembered that Spain has a similar history of terrorist attacks initiated by ETA. Furthermore, since Madrid, Western leaders have learnt to live with their differences over foreign policy. Attacking Britain while the leaders of the free world were present was a mistake, because it was a symbolic threat directed at these leaders en bloc. Chirac, Blair, Schröder, Bush and Putin stood together to denounce the terrorist attacks and publicly commit to a newly invigorated, unified fight against global terrorism. Al-Qaeda has unintentionally encouraged a unity of purpose that has not existed since 2003. Al-Qaeda suffered serious setbacks between 2001 and 2004. However, its merger with Zarqawi's network has given it new 'synergistic' strength. The insurgency will ebb and flow in Iraq, but while the group is strong it is making a powerful statement that it can still strike with devastating effect in Europe. However, because there was no election campaign or moment of division, the attacks were poorly timed. Rather than being thrown into bitter division, Britain and her allies were given an opportunity resolutely to face al-Qaeda down. The attacks were, in a sense, simply too random. Why This Form of Attack? The tube system was an obvious target. Labyrinthine, claustrophobic and archaic, hard to guard but easy to hit. The attacks had the potential to be even more shocking than the strikes in Madrid. Concentrating on the central eastern part of London, the financial district, the attacks brought one of the world's greatest cities to a standstill. Yet this did not bring about the sort of decisive financial difficulties that 11 September brought about. The world's stock markets have experienced several terrorist events now, and traders correctly assessed that little permanent damage had been done to business infrastructure. However, with the same resources the terrorists could have done greater real financial damage. In addition to the transportation of commuters during the day, the London Tube system also carries nuclear waste from reactors at night. A bomb placed on the track would have led to a very lengthy clean up process that could lock up a section of the Tube for months. This would impact Londoners financially but would not kill many and would not cause the same degree of trauma. The deliberate targeting of commuter trains and buses demonstrates that a psychological impact was intended. The attacks were calculated to personally touch as many people as possible, and to resonate emotionally with a much wider audience - hence the deliberate mention of other countries in the statement of responsibility. Al-Qaeda's propaganda insists that the ultimate cause of terrorist attacks lies with the victims of those attacks. "You caused this", they imply, "so you can prevent it." But Britain could not have safeguarded itself from terrorism by backing out of Iraq - or Afghanistan. Al-Qaeda is a professional terrorist organisation - it is not motivated by revenge, but rather its attacks are of a purely utilitarian nature. They are designed to secure the withdrawal of all Western support - military, financial and otherwise - from nominally Muslim countries, including financial support. (Again, to cause division). Al-Qaeda sees this as a prerequisite for the subversion of governments in the Muslim world. It wants the West out of Iraq and Afghanistan because we are standing in the way of its game plan. Those who subscribe to the "give the bully your lunch and he might not beat you up" school of international relations should think carefully about the implications of appeasing al-Qaeda. Aside from seriously risking the establishment of a terrorist state in Iraq, this argument also implies that we should withdraw from Afghanistan, terminating our hunt for al-Qaeda remnants. (Indeed, a withdrawal from Iraq would also be a retreat in a front of the war on terror). Al-Qaeda repeatedly attacked Western targets before the invasion of Iraq - Bali in October 2002, Washington and New York in September 2001, the African Embassy Bombings in Tanzania and Dar as-Salam in August 1998, the Khobar Towers bombing, and on and on. To appease Jamaah Islamiyyah, Australia would have to cease tourism and trade with its closest neighbour. Despite France's stance against the War in Iraq, the French-flagged oil tanker Limburgher was bombed as it left Yemen. To appease al-Qaeda, the West would presumably have to stop purchasing oil from and docking ships with, Middle Eastern countries. If al-Qaeda was given what it wanted, every country would be financially, diplomatically and militarily divided from every other country. It would be a world not of international cooperation but of fear. In the face of the deaths in London and in Iraq, it is difficult not to flinch. But to continue to follow the correct course is not callousness - rather it means these sacrifices were not in vain. Unfortunately, there will be more deaths in this war, which has been declared against us by a nihilistic foe. Obviously all efforts should be made to prevent such attacks, but when they do happen the appropriate response is to ameliorate the effects and hold firm to the right course. By continuing a united and steady course, Blair and the other G8 leaders have shown true leadership. But it is the British people who, by their quiet resolve, have rendered this attack a failure.